This academic year monthly planner keeps you on top of daily, weekly / monthly plans - all in one view with a two page per month format. 18 months, July/December; 6.88 x 8.75 inch page size; 1.65 x 1.55 inch unruled blocks; improved paper resists ink bleed. 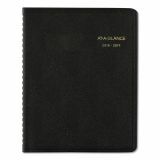 Perforated memo section; two pages per month; past and future calendar references; printed on quality paper containing 30% post-consumer waste; black simulated leather covers. 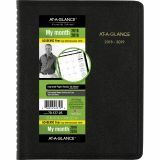 At-A-Glance Academic Monthly Planner - Academic year monthly planner features two-pages per month format for making extended plans. 18 months, July/December; 6.88 x 8.75 inch page size; unruled blocks. Improved paper resists ink bleed. 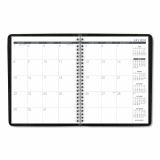 * Perforated memo section; two pages per month; past and future calendar references. 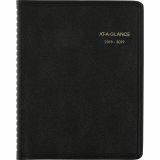 Stay organized and aware of dates, appointments and events. 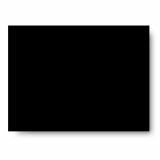 Printed on quality paper containing 30% post-consumer waste; black simulated leather covers. *Under normal usage, this improved paper resists ink bleed with common writing instruments such as pencils, ballpoint pens, gel pens, felt tip pens and highlighters.